Rooms are available at the centre for hourly session rentals and for group work and seminars, with the possibility of referrals. 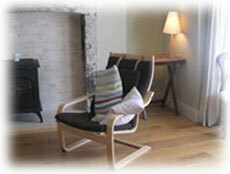 All rooms are wheelchair accessible as are toilet and kitchen facilities. There is also an attractive outdoor patio area. Telephone answering and email services are available and we offer a remotely accessible, internet room-booking system. The centre is close to dart and bus services and parking is readily available on the sea front outside. Details are available from the practice manager.